We are glad to tell you that Inclusive Planet has been accredited as an observer to the WIPO - World Intellectual Property Organization. Rahul Cherian is present at the Standing Committee on Copyright and Related Rights happening at the moment in Switzerland. Following is the statement of Inclusive Planet, India on the matter of the Treaty for the Blind, Visually Impaired and other Reading Disabled, proposed by Brazil, Ecuador, Mexico and Paraguay. Mr. Chairman, distinguished delegates and ladies and gentlemen , I thank the WIPO Secretariat for processing our accreditation to the WIPO as an observer and the decision of this Committee to accredit my organization. I represent Inclusive Planet Foundation, a non profit organisation based in India, focusing on policy reform in the disability space as a part of which we have been campaigning in India for appropriate amendments to Indian copyright law to create exceptions and limitations to enable persons with disabilities to access material in alternate formats. Our sister organisation, a for profit organization runs Inclusivelanet.com, one of the fastest growing social networks for persons with visual impairment, with users from 80 countries. Inclusive Planet's Services division provides technology solutions and consultancy to organisations related to web and content accessibility. We're writing to give you an update on Kindle initiatives relevant to blind and vision-impaired users. A new, free software update is now available for Kindle. Vision-impaired customers will benefit from two new larger font sizes and font enhancements that improve the clarity of the text for a more comfortable reading experience. The largest font available is now more than twice the size of the previous largest font. This software update will be available shortly on all newly shipped Kindle devices and will be delivered wirelessly to all existing devices except 1st generation Kindles. Learn more about the features included in this update. We're committed to addressing the needs of blind and vision-impaired customers and we'll send updates to this list as new, relevant features become available. A famous local artist, Virginia Doyle, has graciously lent her work to Benetech/Bookshare for display on conference room and hall walls. The unique aspect of this display is that in 2002, Virginia was diagnosed with macular degeneration, a medical condition of the eye that makes it difficult or impossible to read or recognize faces. This disease is a leading cause of blindness among older citizens due to the loss of light sensing cells in the retina. Many view her work as representations of the world through the eyes and lens of a person with macular degeneration. Viewers glimpse the world she sees and the gentle places she builds that represent love, nature, peace, and family. A painting Virginia created while losing her vision of a photograph of her retina. Virginia says, "Painting is a wonderful pastime! A day will go by and I don't know it because I'm so happily involved." Virginia painted as a young child in oil and acrylic and then moved on to watercolor, the most difficult of paint mediums, she laughingly declares. "Watercolor is unforgiving. You can't paint over your mistakes!" Today her artwork climbs over boundaries for a more abstract point of view, as she borrows ideas and images from life as a sighted artist. A self-taught artist, Virginia took lessons in all types of mediums from print making to silk screening, color theory, drawing, and to etching. Her free-style art combines the brilliance of Latin America, a place she has lived and the subtle light reflections of French Impressionists, a style she admires. Her artwork is a mixture of colors, shapes, shadows, and form reflections that weave and dance off the canvas. Why Is the Obama Administration Not Standing Up for People with Disabilities? developing countries have no exceptions for persons disabilities. the many countries where people speak English as a second language. produce about 50 new accessible works per year. Paraguay, now joined by Mexico. What changed? Three important things. the end of last year. and IIPA, Ambassador Ronald Kirk, has weighed in against the treaty. MPAA, RIIA, SIIA and IIPA. social justice. I expected more out of the USPTO under David Kappos. under exceptions to copyright laws. It takes a bit of theatrics to be a good tour guide. You ned to know your subject area and then add just a bit more. When you work as a team like Shelley Rhodes you may also want to be sure your parter doesn't steal all the glory! 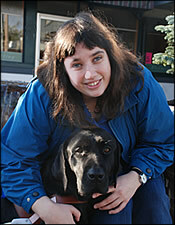 Rhodes is a veteran Guide Dog handler, although Ludden is her first Lab. Her first two dogs were Golden Retrievers. "I got my first, Judson, when I was 18," Shelly, who's now 28, explained. She remembered that first meeting very well. "He gave me a big lick then lay down and went to sleep. I asked the trainer if that was normal, and he assured me it was. Then we had our first trip outside. The dogs had not been worked for a week so they were ready to go. I told Judson to go forward and, oh my gosh, suddenly he was dragging me down the street. It was like being pulled by a freight train. Then he stopped at the curb and got himself calmed down. He's turned out to be a great dog. He and I were partners through college, graduate school and my first job. He's retired now and living with my parents." She said Judson was known to be a real ham. Once they were invited to help guide a float in a Macy's Thanksgiving Day Parade. "He loved it," she said. "Being a Golden, he thought all the people along the way were applauding for him. He even got to lick [smooth jazz saxophonist] Kenny G that day." Rhodes and Judson were campus tour guides at college and he was so popular he was presented with an award. "He was such a show off," she smiled. "At the ceremony when he got on stage to receive his reward he turned to the audience, tail wagging, smile on his face and lifted one paw as if to say 'Thank you very much.' He got a standing ovation."